Aya Burweila is a Senior Analyst at the Athens-based intelligence and security think tank, RIEAS (The Research Institute for European and American Studies). She is a member of the International Advisory Board for the Mediterranean Council of Intelligence Studies (MCIS) and an expert on Islamic Fundamentalism and Energy Security. Aya's work has appeared in The International Journal for Intelligence and CounterIntelligence, the Oxford Law Society Journal, and distributed by the Canadian Center for Intelligence and Security Studies. 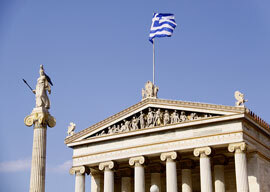 Will Greece Rise from the Dust?